How do you present big data in a way that business leaders can quickly understand and use? This is not a minor consideration. Mining millions of rows of data creates a big headache for analysts tasked with sorting and presenting data. Organizations often approach the problem in one of two ways: Build “samples” so that it is easier to both analyze and present the data, or create template charts and graphs that can accept certain types of information. Both approaches miss the potential for big data. Instead, consider pairing big data with visual analytics so that you use all the data and receive automated help in selecting the best ways to present the data. This frees staff to deploy insights from data. Think of your data as a great, but messy, story. 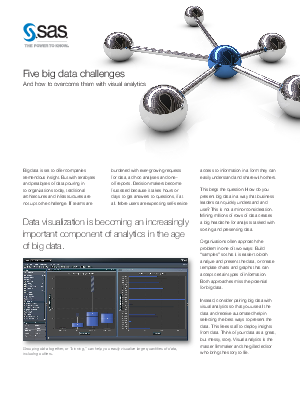 Visual analytics is the master filmmaker and the gifted editor who bring the story to life.